Is the Wikipedia definition for bid management in the context of this blog post? No – it was just part of the SERP that I screen captured. I’ve edited the post so it makes more sense. Thanks! Thanks! On another note, AFAIK, the # of entries in the SERP is an indication of the amount of online content available for the said keyword, not necessarily of the # of people who are searching for the said keyword. To get a handle on the latter, I’m sure you’d agree that Google AdWords Keyword Planner is a better tool. And the two figures can be drastically different from each other, as I learned when I wrote my blog post http://gtm360.com/blog/2014/02/14/increasing-sales-marketing-alignment-big-bang-doesnt-work/. “The 4.3 million results you’ll find when you Google for “Sales Marketing Alignment” testify to the humungous amount of (online) chatter on this subject. On the other hand, there were merely 20 searches for this keyword last month.” I didn’t check the search volume for “Bid Management” on Google AdWords Keyword Planner. Maybe it’s as high as the # of SERP results. Apologies for not pointing this out earlier – unless the line “So clearly, people are searching for help with bid management.” is a part of your edit. I was merely pointing out the fact that people are advertising on this keyword – which means there are enough people searching for it to make it worth bidding on. You’re missing the point of the post. I agree with you here. With smaller clients with smaller budgets, we stay with manual bidding until perhaps a campaign comes along that is really converting well and consistently, then we’ll consider Automated like Target CPA. I’ve actually seen that outperform manual after it’s had enough data and it makes it easier on us to utilize Target CPA. However, in some cases we may even separate out top converting keywords from that automated group and bid on them manually with Exact match or related. With larger accounts, most times we are trying to get to automated bidding in most campaigns. However, we typically use some manual bidding in some top campaigns to have a little better control, especially when the client is competitive with their competitors or wants to see them ranking high for certain keywords regardless. I think Google is moving more towards automated bidding over the coming months/years, so we’ll continue to see more of this. Good approach. 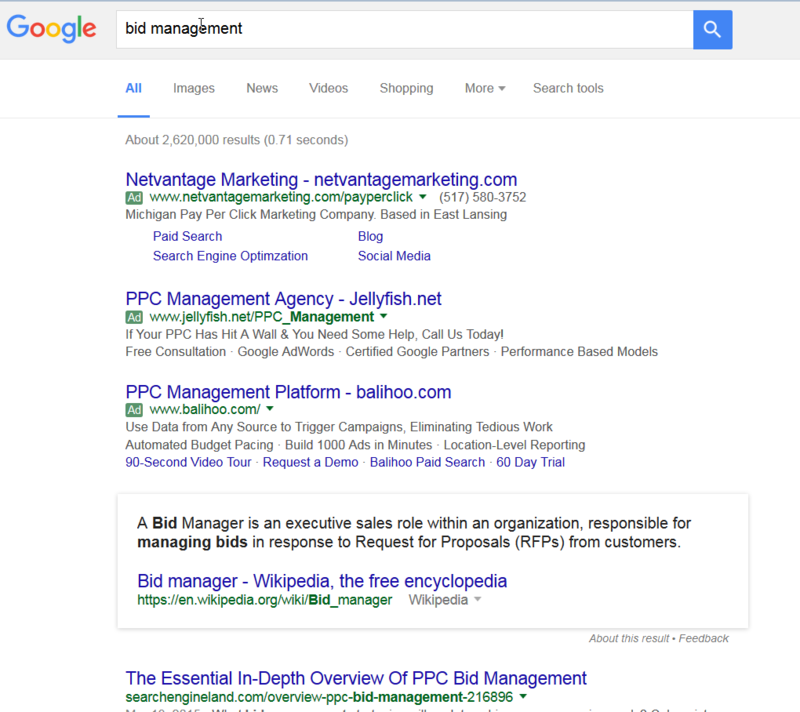 And I agree, Google is really pushing automated bidding. It will be interesting to watch this as we go along. Thanks for your comment! Let loose an autobidding technology on a poorly constructed adgroup and all you get is a throttled-back attempt to convert occasionally on some broad-matched terms, for example. Garbage in, garbage out. The set-and-forget stuff often probably approximates more bespoke approaches, and no doubt exceeds weak/lazy management, but call me old fashioned… even while using various tools and automations to achieve scale, there is a degree of polishing that always improves account management, IMO. And of course, the degree of polishing you are willing to put into it should be based on how much time you reasonably devote to x spend. The question to ask, if everyone turns on the same bidding tools (Google’s), are there any shortcomings in the bidding that individual advertisers may face, such that you could outdo them with a more customized approach? I tend to think so. Would be interesting to chat offline as to why that can possibly be. I love the idea of different strategies going head to head against one another, and the obviously “better” (off the shelf automation) version not winning. We should come around to admitting that it is about winning, at least. Many in the industry appear that it is possible to win in tough auctions by just following best practices. Well, in a pricey, cut-throat auction, like anything in business, average is unprofitable. Only insanely great will do. “Here’s to the crazy ones. The misfits. The rebels. The troublemakers. The round pegs in the square holes. The ones who see things differently. They’re not fond of rules. And they have no respect for the status quo. You can quote them, disagree with them, glorify or vilify them. About the only thing you can’t do is ignore them. Because they change things. They push the human race forward. And while some may see them as the crazy ones, we see genius. Because the people who are crazy enough to think they can change the world, are the ones who do.” – Apple commercial. To be sure, at the end of the day, there needs to be a significant degree of automation. Keyword bids aren’t the only AdRank influencer available to us, certainly. Even if you take a single type of bid adjustment — geo — in a mid-sized account with 20 campaigns and a modest 50 geo segments to manage, that’s potentially 1,000 individual bid adjustment tweaks a human would have to do, weekly, say. Now, I would gladly do that three times a week (see above — crazy, misfit, etc. ), but most won’t. So most humans are going to do that neither accurately nor consistently nor conscientiously. There have to be tools to make up for those human frailties, obviously. But do they necessarily have to be Google’s tools? IMO, no — there is still room for third parties to innovate. I think smaller accounts should stick with mostly manual bids and make sure you set a reasonable budget to keep from over-spending as Melissa said. Larger accounts are going to be motivated to automate things, but they do so at their own risk. Trusting Google to look out for you 100% would a very naive thing to do. I think the best option would be to set up some automation, but us it more as a helper to alert you to things you may want to change. For us, after an account has been set up and optimized for a few months, I won’t touch it again for years sometimes unless I see costs go up or conversions go down. In many cases if you have set things up correctly and then optimized for 3-6 months you don’t have to worry about it. Of course, you DO have to check it and we do that weekly on an account level.